February 8, 1897:“Randsburg, Feb. 4—(REGULAR CORRESPONDENCE) A VISIT WAS MADE YESTERDAY TO THE VAL VERDE GROUP OF MINES just north of Johannesburg, the property of the Randsburg Mining, Milling, and Water Company. There were about a dozen in the party, nearly all practical miners, some looking for investment and others out of curiosity to see the mines. The Val Verde No. 1 on which nearly all of the work has been done, has one shaft seventy-eight feet down, showing a vein of ore from the surface to bottom of never less than five feet, and sometimes seven, in thickness. The hanging wall is regular and smooth, holding without timbering, and the footwall is well defined. The first seventy-tons of ore from this mine was milled at Koehn Springs, yielding $30 per ton. The balance, something like 150 tons, has been milled at Garlock, with about the same result. The Benson Boys have been working it on a lease from Mrs. Burcham, the owner, until a few days ago when work was suspended and preparation made for the new company, who will take hold and begin operations about the 15th of this month. The last load of ore was hauled away today. The vein or ledge can easily be traced for a long distance on the surface, but the shaft spoken of is on nearly the highest point, and about 400 feet from the southwest center end of the mine. Lower down the hill some work has been done, and a hole dug, maybe fifteen feet, showing a larger vein of ore than at the shaft, which prospects about $12 per ton. The company has secured this mine and two others contingent to it called the Val Verde Nos. 2 and 3.But little work has been done on these except to prospect and locate them. Col. J. W. Pender, one of the directors and engineers has gone to Panamint on a short business trip and immediately upon his return will begin the boring wells in Cuddeback Lake, where they expect to get there water supply. This lake is distant about nine miles from the mine, and about ten miles from Randsburg, Between the lake and the mine is an elevation of 600 feet or less, and from the highest point to the mine, a distance of a mile, there is a fall of 100 feet. They have filed on four mill sites at Cuddeback Lake. Consequently they can bore a number of wells. This lake drains a wide extent of territory, and the water comes near the surface. Willard and Harrison, who have a mill at the lake, reached the first water at twenty-five feet, but it was not good. At 110 feet they found more and better water, but not until they reached 180 feet did they find water of a pure quality, and lots of it, rising to within twenty feet of the surface, the other having been eased off. There is also an old well near there from which the St. Elmo mine people are now getting their water supply, dug by John Searles twelve years ago on the old borax road to Death Valley. This well is ninety feet deep and furnishes a large amount of water. Artisan water would doubtless be reached at a greater depth, as all the indications point to it. The Randsburg Mining and Milling Company expect to erect a ten stamp mill on the southwest end of the mine and about 400 feet distant from the main shaft. The mill will be enough lower than the working shaft that if the ore is hoisted twenty feet above the shaft it can be emptied into a chute and delivered at the mill without ever being handled, except when loaded into the tubs in the mine to hoist it out. The estimated cost of sinking the wells, buying the pipe, putting it in place, procuring the necessary pumping plants, two of which are contemplated in this estimate, is $28,000. The company also expects to put a custom mill somewhere in the lower part of Randsburg. The water from the highest point on the pipeline would have a fall of nearly 200 feet in this case. They expect to be able to crush ore for outside parties for $6 a ton. E. G. Arthur, a practical mining and milling man from Colorado, who was one of the party, gave it as his opinion that after the water plant was in and everything working smoothly with the large body of ore in the Val Verde, the cost of crushing and mining with a ten-stamp mill ought not to exceed $5 per ton and with a twenty-stamp mill, where practically the same labor would run it, the cost ought not to exceed $3 or $3.50 per ton. A good deal of stock has been taken by practical men here in Randsburg. W. K. Richardson, who has worked in the mine, and is thoroughly acquainted with it has taken $8000 of the stock. March 12, 1897:“THE RANDSBURG MINING AND MILLING COMPANY has leased the mill of Harrison and Willard at Cuddeback Lake, has cleaned out the well, and is boring another within 100 feet of the old one, so as to have plenty of water to all, all the time, night and day. This mill has a capacity of ten tons per day, and while the company will mine very much more than that, the balance will piled up on the dump until there is a mill erected at the mines and the water piped to it. May, 1897:“A FAR MORE EXTENSIVE PROPOSITION IS THE VAL VERDE GROUP, which has been bought by the Randsburg Gold Mining, Milling and Water Company, a corporation of which Col. J. W. Pendar is president and Manager. Colonel Pendar has mined in Wales, Cripple Creek, Chihuahua, Costa Rica, Leadville, Elkhorn (Montana), and the South African Rand. After an investigation of four months the company he has organized has bought the Val Verde group, which is made up of the Val Verde, Val Verde Number 2, Val Verde No. 3, and La Monte claims, 140 acres in all. They lie a half a mile East of Johannesburg, and on the same gold zone as the Rand group. Probably no person has made a more thorough investigation of the geology of this section than Colonel Pender. His expenses all the time he has been on the Rand he told me, for traveling and assays, had been in the neighborhood of $350 per month. The gold belt, he says, is 110 or 115 miles in length, beginning seven miles south of Mojave and extending to 15 miles north of Post Office Springs in the Panamint Range, west of Death Valley. The width of the belt is from two to ten miles, and it outcrops chiefly in four places, — at its extreme southern end, the Mojave district; at the Rand, its largest outcropping, in the El Paso district, and on the Panamint Mountains. To return a moment to the Val Verde’s development and plans. Three shafts have been sunk, the deepest about 75 feet, and the company plans thorough development and improvements, It has leased the Cuddebach Lake Mill for three months, with privilege of three months more, by far the best mill in that region, — it is sinking wells for further water supplies at that same place, and proposes to pipe it to the company’s works to supply mills on the ground. June 20, 1897: ADVERTISEMENT– “STATEMENT OF THE DEVELOPMENT WORK OF THE VAL VERDE GOLD MINES , AND OTHER PROPERTIES BELONGING TO THE RANDSBURG GOLD MINING, MILLING AND WATER SUPPLY COMPANY. VAL VERDE NO. 1—UPPER INCLINE SHAFT—The development of this property has been systematically carried on now for some months, under the most capable and efficient management, and now the mine shows an inexhaustible supply of the precious metal. The main incline is situated at the top of Val Verde Hill. Which showed after some preliminary development of ___ feet of ore, averaging about $12 per ton. As depth was obtained the ore body not only gradually widened out, but became richer in value, and now, at a depth of about two hundred feet, we have a good body of fine, free milling ore which will average at the mill, about $25 per ton. Running through this is a streak of extremely rich ore, which averages from $200 to $300 per ton. This streak appears to be permanent and continuous, and if so we will have one of the most remarkable mines in California. We have shipped a great deal from this shaft to our mill at Cuddeback Lake, and we are still developing is as rapidly as money and time will permit. From the first seventy feet of work done, $7000 in gold was taken. We have build ore dumps, car lines, ore chutes, etc., so that the ore can now handled in good shape, with but little cost, as the ore is carried out of the mine on cars built for that purpose and is dumped directly into the ore wagons without rehandling, and then hauled by splendid ten mule teams to our mill at Cuddeback Lake. This saves handling and reloading of the ore, which is a big item of expense. THE VAL VERDE NO. 1- INCLINE NO. 2—It was in this incline that the big strikes were made the other day, when ore was discovered which ran about $600 per ton. It had developed into a big body of good medium grade ore which can be easily worked. The ore body to the west is so great that it is worked more like a quarry that a mine. On Monday what was supposed to be the head wall was discovered to be in reality, ore. Free gold is visible in the rock and the only question to determine is, how much is there of it. We are developing this property to this end. THE VAL VERDE NO. 2—This property has been developed considerably in the No. 1 shaft. We have found ore that runs in big paying quantities, which with the proper modern methods of treatment and the late improved machinery, namely, good stamp mills and other labor saving devices, a fortune could be made from this mine alone. We are working now in No. 1 shaft and in an open cut, with splendid prospects. THE VAL VERDE NO. 3— It is on the adjoining property, the Alameda, such fabulously rich strikes were made about three weeks ago, ore averaging as high as $3000 per ton, and which still continues to produce extremely rich rock. Mining authorities claim that this vein is but a continuation of the Val Verde, and that the vein running through the Val Verde properties, and extending through the Alameda is a true fissure vein of great continuity and richness. In face, the Val Verde Hill appears to be A MOUNTAIN OF VAST MINERAL WEALTH. Some of the ore shipped from Val Verde No. 3 is a dark-looking mass of decomposed quartz, granite, schist, and slate, resembling anything rather than rich gold-bearing mineral rock, but when pounded up and washed out it shows remarkable rich in gold. THE LUNA, SOLAR, ZEPHYR AND LA MONTE—Lie beyond the Rand group and towards the Stringer district. LA MONTE—We have a shaft down about 80 feet, disclosing some of the most splendid specimens one can see anywhere full of gold particles, beautiful to look upon, so different from the average Randsburg rock. We have shipped from this mine a little rich ore. The mill returns give us fully $90 per ton. Late news tells us that the La Monte is developing into a most phenomenal property and will produce some wonderful ore. We are vigorously developing this mine. THE ZEPHYR— Lies on the same ledge and probably will produce about the same quality of ore. But comparatively little work has been done owing to lack of funds. We are down about 65 feet. THE LUNA— Is apparently very much of the same formation. From an open cut similar rock was taken out that assayed high, but the vein did not prove as lasting as the La Monte or the Zephyr. THE SOLAR—Is on the same ledge apparently as the La Monte, and with proper developments, we believe can be made a good mine, as the location is excellent. OUR CUDDEBACK LAKE MILL— We have been keeping our mill in most active operation and had we twenty stamps additional, we still could have kept it busy, as the ore from the Val Verde mines seem to be inexhaustible. With an additional modern twenty stamp mill we could not only reduce the cost of milling over one-half, but we save over 20 per cent more gold with the use of this modern machinery, besides we could then accept for treatment ore from other mines, which would net the company big profits. OUR WATER SUPPLY— We have already a sufficient water supply for our own mills and our other wants, also plenty of additional water to run a new twenty-stamp mill, which we contemplate erecting. This water supply is of the greatest importance in a district like Randburg. The water supply in every mine and mining camp is an important factor in the development of the same, hence this company holds the keys which unlock the avenues leading to active operations, and to the ultimate upbuilding and prosperity of the city of Randsburg, dependent as it must be upon an efficient water supply. The completion of Artesian wells will give the company an immense body of water, enabling it to supply Every Mine, Residence, and Business House in Randsburg with this valuable necessity of our daily lives by an extensive pipe connection. As a commercial proposition the supply of water for milling and domestic purposes is in itself a guarantee of large dividends and the speedy enhancement to its full value, and beyond of the shares of the company. July 11, 1897:“THE VAL VERDE GROUP consists of seven mines owned and operated by the Randburg Gold Mining, Milling, and Water Company. They cover an area of 140 acres. Three of them, the Val Verde, Val Verde No. 1, and Val Verde No. 2 are situated close to Johannesburg, and have been in full operation for the past six months, and from which some very rich ore has been taken. On the Val Verde proper there is an incline shaft 120 feet deep, which shows rich pay ore from the surface down. On the Val Verde No. 2 development work has been in progress for the past three months. In both shafts the ore bodies are growing larger as the go down, and at present the company are shipping about fifteen tons a day to their mill, which is about the full capacity of the present crushing plant of the company. One vein in the Val Verde No. 2 proved a pleasant surprise to the management for, while at the surface it only showed two and one-half feet of ore milling $20 a ton, it now shows a well defined ledge of five feet which mills an average of $25 a ton. On the Val Verde No. 1 but little development work has been done, although there are numerous indications that this property will prove fully equal to any of the others. The intention of the company is to fully develop incline No. 1 by sinking to a depth of 300 feet, and contracts are also being let for the sinking of an additional 500 foot shaft, which, when finished, will make it the deepest shaft in the district. 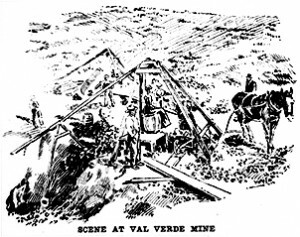 July 25, 1897: “TWO MEN ON THE EL MONTE, ONE OF THE VAL VERDE MINES in the Stringer district, have taken out in the last two weeks, ten tons of ore, which will mill $125 per ton.” – The Los Angeles Daily Times. September 17 1897: “THE LAST REPORT RECEIVED BY THE COMPANY FROM SUPERINTENDENT QUINN at the mines shows the shaft on Val Verde No. 1 is down 250 feet, and showing a strong body of pay ore, which has increased from three and one-half feet at the surface to over nine feet at the bottom of the shaft, and the value of the ore increasing as it goes down. This shaft is sunk of the pitch of the vein, which has an inclination for about sixty feet of about 30 deg., from the horizontal. Below that the inclination increases, and on the bottom is now on an inclination of 45 deg., and fast righting itself up to an almost perpendicular position. This is considered a favorable inclination the mine, as it shows a relation if the vein to the great porphyry dyke that traverses the lead on the hanging side. In this shaft work is being carried on day and night, with the object of gaining depth in the shortest time possible. In shaft No. 2 on this same claim they are down about fifty feet, and the superintendent reports that they have squared up a face even with the collar of the shaft for a distance of fully fifty feet, exposing a deposit of ore the entire distance, and averaging some ten feet in thickness. He has at this point blocked out he estimates, fully three thousand tons of ore that can be mined at an expense not to exceed $1 per ton, and can be milled, if there were a plant on the mine, at an additional cost of $1.50 per ton. The ore he says will average from $20 to $40 per ton, and there is enough of it in sight to justify the erection of a ten-stamp mill. December 14, 1897: “VAL VERDE STOCK—The transactions in Val Verde mining stock, both on and off the floor of the Mining Exchange, continues to be a fruitful topic of gossip among the brokers and business men who deal in mines and mining securities. The statement made by telegram from Randsburg on Saturday to the effect that James R. Wilde, the late secretary of the company, who “dumped” 250,000 shares of Val Verde stock on the market and then “skipped by the light of the moon,” had been discharged on November 16, 1897, is laughed at by the brokers. As late as December 4, 1897, Mr. Wilde was in charge of the books, the stock certificate blanks and the corporate seal of the company, and even at a later date this month. President Burcham of the company that owns the Val Verde mine, wrote to a broker here asking about Wilde, where he was and what he was doing, but making no mention of his having been discharged. The law compels every company issuing stock to keep an office open every day in the year, except Sundays and legal holidays, where stock certificates may be transferred. There has been no office of the Randsburg, Mining, Milling and Water Supply Company open in this city, where their stock certificates say their office is located, since Wilde disappeared about a week ago, but up to the time of his disappearance and long after November 16 inst. Wilde conducted the office of the company and sold stock. The stock sold by Wilde is positively claimed to be good, whether an over issue or not. It is signed by the president and secretary of the company, and the seal is properly affixed. If Wilde has issued more stock than the company has a right to issue under the law, then the over issue will have to be made good by canceling enough of the genuine stock held by the officers and original stockholders of the company to cover the over issue and thus put the bogus shares on a foundation with those legitimately issued. The only losers in the transactions are the Val Verde people, and this is not the first time they have lost money in the same way. Some months ago, when the Randsburg mining boom was at its height, a man named Huteson was secretary of the company. He sold stock in the company’s office, as there was no mining stock exchange at the time, for fancy prices and issued as many shares as he could sell, then pocketed the receipts and disappeared. The company took care of every share of stock he sold. Wilde was given Huteson’s position and apparently improved on his methods of doing business. Wilde issued certificates without date or name of the purchaser entered, but calling for a specific number of shares. If it is true that Wilde was removed as secretary on November 16 last, these shares will be absolutely good , since they can be dated November 1, 1897, or any other date the purchaser chooses to give them. L. A. Druble, who is said to have bought about one hundred thousand share of the Val Verde stock from Wilde, and still wants more, says Mrs. Wilde told him, before she left for England last Thursday, that her husband has run away with another woman. She said she was in England when friends wrote to her of the liaison Wilde had formed, and she hurried home. Her husband was very taken by surprise, and was very angry because she had returned. He as once began making plans to leave her, and, in order to raise money, floated the Val Verde stock. The Val Verde company is hunting Wilde, and will prosecute him, if caught, for felony. As president R. L. Burcham of the Val Verde owns, or did own, about a million shares of the company’s stock, he is in a position to take care of Wilde’s over issue should it prove to be such. What the brokers want to know, is whether the company proposes to open an office so that certificates of stock can be transferred. Before leaving Wilde scattered the books, seal, stock certificates, etc., among a number of offices, leaving a ledger here, the seal there and so on. It will, therefore, take some time to get the office in running order again. Unless the company opens an office this week, some of the holders of the Val Verde stock will petition the courts to appoint a receiver for the company. This action has been decided upon. “Whether the Val Verde secretary issued stock after his alleged removal is an open question, bur not a question of vital importance, since the companies ledgers and stock books where in his hands two days before he left town, with certificates signed by President Burcham, who stayed in Randsburg, but kept company stock here, thus made out for the secretary to sign and sell. The claim that the secretary was removed a month ago was not made until after the Times’ announcement last Saturday of his departure. Val Verde stock is printed on the callboard under the head of “unlisted” stock. It so appears in the stock quotations published daily in The Times. Stock buyers know that good and bad stocks may be sold under this pit tracking method. Listed companies are required to make monthly reports to the Exchange, showing the amount of stock sold, the price realized, the quantity on hand, to amount of work done, the ore produced and the nature of all expenditures. Unlisted companies do no business on the exchange. They regard it as an obstruction to their methods. In the case of the Val Verde, until the exchange trading brought the price down to 1 or 2 cents a share, on a level with listed prospect stock, promoters actually sold much of it in the Val Verde office in the Wilcox Block for 12 ½ to 25 cents per share. When the promoters could sell no more stock at those prices, because original holders began selling through exchange brokers for smaller figures, the company advertisements were discontinued; the financial agent with a parting malediction on the exchange, sold the remainder of his stock in his hands at one-tenth of the price realized by office sales and took a trip to Europe. In selling to the brokers, Mr. Wilde claimed to be disposing of his personal holdings. This may or may not have been true. If he sold company stock too cheap, the company was betrayed, especially if he pocketed the proceeds, but the buyers are safe. If Wilde issued more stock than the company is entitled to issue, he is liable to go to the penitentiary, for that is a felony. As the stock was also signed by President Burcham, the felony charge may also be made against him, although he is doubtless innocent of offense. His official negligence and his trust in the secretary would make him liable. If there were an over-issue, President Burcham could make it right by canceling some of his own million shares. But the legality of outstanding stock cannot be questioned by the company. Very little Val Verde stock has ever been bought on the exchange, until this “slump” occurred, and when any was bought is was generally by a broker for speculation and resold to other brokers. They have never pushed this stock publicly, because of the manner in which secretaries and promoters handled it, the exchange generally preferred to sell listed about which they could learn something, while brokers believe that all the Val Verde stock issued is good, it is just as well for the public to continue to keep hands off, and let brokers, who think they know what they are about, have it out with the company until the true state of the affairs is known. The Mining Exchange acts simply as a clearinghouse. It cannot tell if a certificate is forged any more than can a bank clearinghouse pass upon a check. A broker who has a certificate of stock in the New York Central Railway could offer if on the exchange. If it were purchased the exchange would pass the certificate from the selling broker to the buying broker. The exchange would not guarantee that such a company exists, and therefore the sale would go under the head of “unlisted” stock. In the case under discussion the brokers buying know that Mr. Wilde had gone when the exchange trading was going on, and today none of the stock could be had on call though a bid of four times the selling price was made. This Drawing of the Val Verde Accompanied the October 31, Article on Randsburg Gold Mining and Milling and Water Supply Company. These Primitive Mining Methods Show That the Investment in Their Stock Was Indeed Speculative As They Had Yet To Even Put In a Gasoline Powered Winch. December 15, 1897:“A DISPATCH FROM RANDSBURG in response to a request for information from President Burcham of the company that owns the Val Verde mine, say Secretary Wilde had no authority to sell any stock except his own and that the company will not make good any fraudulent stock. December 16, 1897:“WHETHER JAMES B. WILDE, LATE SECRETARY OF OUR COMPANY, SOLD AN OVER-ISSUE of the Val Verde mining stock, or not, we do not know.” Said W. A. Harris, the attorney of the Randsburg Mining , Milling and Water Supply Company, which owns the Val Verde mine. Mr. Harris, returned from Randsburg yesterday, and will now enter upon a systematic hunt for the books of the company, which should be in the secretary’s office, especially the stock book. “If I should say to you that Mr. and Mrs. Burcham, who practically own the Val Verde mine know less than you do about Mr.Wilde’s movements, I would only be stating the absolute facts.” He continued. That the brokers consider the Wilde stock good is evidenced upon the floor of the Mining Exchange, where as high as $8 has been bid for stock the he issued at $1, bus as there is no office of the company in the city where transfers of stock can be made the sales have fallen “short” the sellers being unable to deliver the goods to the buyer. Attorney Harris intimated yesterday that there would be a new office and a new secretary for the Val Verde mine in a day or two—as soon as the books that Wilde has said to have distributed together with the company seal, can be got together. ” – The Los Angeles Daily Times. DECEMBER 18, 1897:“THE ABSCONDING OF JAMES S. WILDE, THE SECRETARY OF THE RANDSBURG MINING COMPANY, Val Verde group, has been s source of speculation with mining men here ever since the first notice came out in The Times, nearly a week ago. It now appears that, although Mrs. Burcham was elected assistant secretary November 16, yet Wilde was not displaced as secretary until a meeting held by the directors on December 6. The company was making no money, and did not feel as though they were able to stand the expense of a secretary outside their own number. Wilde received no salary after October 30, but was allowed to retain the books and papers of the office for the purpose, according to his own request of posting them and putting them in shape before turning them over to the new secretary. He had the stock book up to December 6. He had originally 75,000 shares of his own but had placed 15,000 shares in England among friends sometime ago. It is supposed that he had about 50,000 shares shortly before his leave taking. The officers of the company here, President Burcham and Secretary Burcham, say he has no right or authority to sell more than his own shares. He left Los Angeles November 27 ostensibly to come to Randsburg, to the office of the company here, as the office is no longer kept open in Los Angeles. When he did not come inquiry was naturally made as to his whereabouts, but to the present time he has not been located, although the officers are making, so they say, every effort to find him and bring him back to explain things, which now look crooked. When the books were finally sent here, all except one stock book and the seal, they were and are in bad shape. Burcham says that he had no power to sign checks or to officially act for the company after October 30. He came here well recommended by such men as Maj. Bonebrake, and other prominent men in Los Angeles. The Times correspondent was shown one letter from a prominent businessman of Los Angeles, bearing as late a date as October 6, highly recommending Wilde. This was in answer to an inquiry as to his standing by an outside party, who for some cause wished to know. The woman who personated Mrs. Wilde was here stopping with him at the Hotel Johannesburg for some weeks in May and June and was introduced to all as his wife. Nobody here was aware of anything different until a couple of weeks ago , when the real Mrs. Wilde came to the hotel and registered. She was only here a couple of days, and the time Wilde was not here. ” - The Los Angeles Daily Times. March 12, 1911: “The Phoenix mine is again the scene of activity after having been idle for many months. C. A. Burcham the owner, of the mine, has employed a crew of men and sinking has been commenced east of the old Phoenix workings. Work was started toward putting the five stamp mill in shape about two weeks ago, but a broken camshaft resulted in considerable delay. On Thursday a new shaft was put in position and the mill is now busy crushing ore from the mine. During the present run some ore from other properties will be crushed, and it is planned to keep the stamps dropping continuously for about 90 days. To Whom It May Concern: –I will not be responsible for any labor performed or for any material furnished on the Phoenix group of mines, or in mill or buildings situated on the same, in the Rand Mining District, Kern County, California. 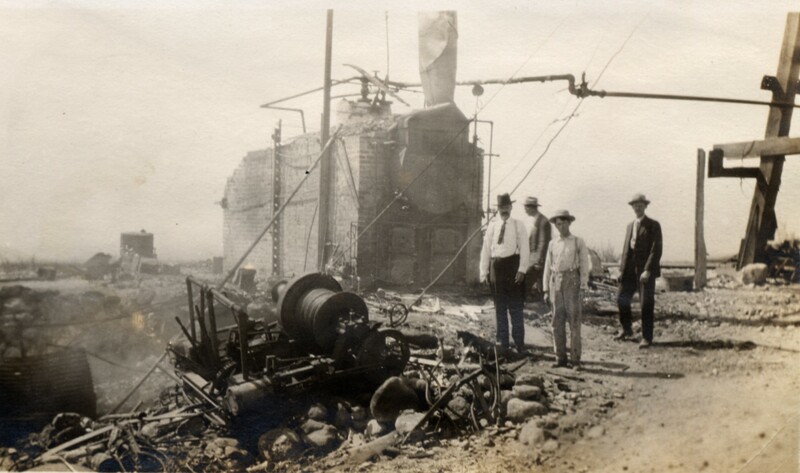 February 23, 1915: “PHOENIX MINING CO. OVERHAULING ITS EQUIPMENT – Many Improvements Being Made –Property Near Town of Randsburg –The equipment of the Phoenix Mining Company at Randsburg is being thoroughly overhauled. The water system is being completely changed, the mill floor, ___dred, useless odds and ends discarded from the mill and it now bears the aspect of cleanliness, showing that the place is in the hands of people who intend to work the property on systematic mining principals . A new centrifical pump, with individual motor has been installed and is working very satisfactory. March 10, 1915: “ILLINGWORTH & LANKA HAVE LEASED the Phoenix Mining Company’s property in the Johannesburg section and are planning extensive development work. The property is equipped with a 10-stamp mill, with cyanide plant and electric hoist. May 22, 1915: “PHOENIX MINE GETS BRICK WORTH $1,150 –The Phoenix mine at Randsburg had a cleanup of $1,150 Wednesday. Owing to the misfortune of a broken crankshaft and the delay in the shipment of a new one, the mill stood idle almost two weeks, causing a less valuable cleanup than usual. From the very start Supt. Lanka made this mine a paying proposition, which is something unusual. The mine is undergoing some development work in the nature of sinking a winze off the second level where new ground will be worked, and at a greater depth. April 19, 1915: RANDSBURGS MINES CAN BE MADE A PAYING PROPOSITION when the right kind of management is used as is shown by last week’s clean-up at the Phoenix. The month’s run from the Camperdown shaft resulted in a clean-up of $2,050. About 100 tons of ore are in the bins awaiting reduction. The extraction is coming from the 350-foot level where 5 feet of $20 rock was encountered. The Phoenix Mining Company is situated in Johannesburg, and has the very latest equipment throughout, consisting of a ten-stamp mill, a twenty-five ton cyanide plant, agitating process, for the treatment of about 38,000 tons of tailings, electricity is used for hoisting, mill power, pumping, etc. Besides the main shaft where the ore is ten feet in width, with $15 values, is situated the Camperdown shaft, with ore bodies running six feet in width, carrying higher values than does the main shaft. 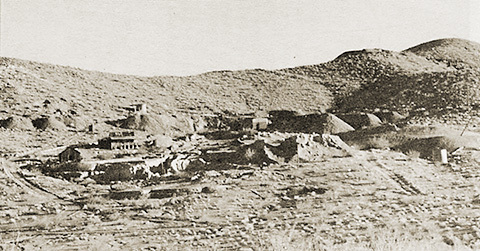 March 1925: “DURING 1923 the Operator Divide Mining Company took over a group of 7 claims, including the old Phoenix Mine, and located just north of Johannesburg. 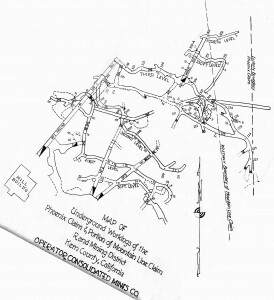 Five known veins cross the property, the two principal ones having been worked in the Phoenix Mine. The veins strike northwest and dip 21 degrees NE. The vary from mere stringers up to thickness’ of possibly 7 feet, being lenticular in habit. The Phoenix mine is developed by an incline shaft 300 feet deep, and by over 2000 feet of workings distributed through 6 levels. Two of these levels were driven from a winze which extends 100 feet below the bottom of the shaft. The mine was equipped with a 5-stamp mill when taken over the Operator Divide Mining Company. This has been remodeled and 5 new stamps added, making 10 in all. The Phoenix Mine is credited with a production in past years of about $600,000. Over 35,000 tons of ore were milled, giving an average value for all the ore mined of about $17.00 per ton..00 The deepest working are 300 feet and are in good ore. The potential value of the mine is exceedingly attractive. Best of all, the Company owns the mine. April 9, 1926: “ACTIVITY OPERATOR CONS. IS EXPLAINED.—Will Handle 50 Tons Daily by Addition of Five More Stamps—Randsburg, Cal., The Operator Consolidated Mines Company is preparing to enlarge its Phoenix mine and is installing five new stamps as an addition to its present battery of the same size, which will be sufficient to handle 50 tons of more of ore a day. The property was formerly known as the Val Verde group owned by C. A. Burcham, one of the three original owners of the Yellow Aster, and has a production record or more than $600,000 in gold. The mine is located about one-fourth a mile from the Santa Fe railroad station at Johannesburg, a mile from the Yellow Aster and a mile from the Kelly Rand silver mine. To provide an adequate water supply for the mill a pipe line has been laid three-fourths of a mile to springs from which water will flow by gravity to the mill. Water was formerly purchased in huge tanks from the railroad company and pumped to the mill from the railroad. Under Burcham’s ownership the Phoenix mine is said to have produced about 35,000 tons of ore averaging $17 per ton in milling gold ore. It was Burcham who, about 28 years ago left a round of holes drilled in the bottom of a 40-foot shaft in the Kramer hills and joined a rush to the Randsburg region without firing them, and which, when loaded and shot, two or three weeks ago John and Ed Herkelrath exposed ore that is said to run $1.000 a ton and has caused a stampede of mining men and prospectors into the Kramer hills. But Burcham became one of the original owners of the Yellow Aster mine, which has produced $10,000,000, and has also became the owner of the Val Verde group, which yielded more than $600,000 from surface to a depth of 300 feet and a length of about 300 feet along the strike of the developed veins. The Pinmore mine, which adjoins the Phoenix mine and covers the same veins, is reputed to have produced about $1,000,000. The Phoenix was bought about two years ago by the Operator Consolidated Company. As part of its plans for more aggressive development this company has also installed a large air compressor for drills and other purposes. 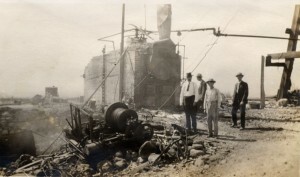 August 23, 1936:“RANDSBURG PROPERTY, — Phoenix Mine. The property at Randsburg, California consisted originally of seven claims. During 1936 the present management acquired an additional fifty-two acres of mineral ground adjacent of the original ground and the Famous Pinmore Mine. This ground is owned under U. S. Mineral location and has been a valuable acquisition at very small cost. The property and ore reserves are carried on the books at the nominal value of $2.00, although the commercial ore is sight has been estimated in excess of $200,000. The buildings, water system, machinery, truck and equipment listed on the financial statement are all on the Randsburg property. In the last few months the pipeline from the Yellow Aster water system has been renovated and also cut into the Little Butte pumping plant. Mine rails and skip at the Phoenix incline have been re-laid and repaired and ore chutes built in the mine. An electric hoist has been installed. The Stamp mill has been reconditioned and a new concrete foundation put in to replace the old wooden foundation. The compressor, motors, and transformers have been cleaned and repaired. The mill building has been repaired and painted. The water tanks and settling system have been rearranged for efficient operation. In April a contract was entered into with a Southern California concern to direct the rehabilitation of the plant and advise and superintend the installation of new equipment. This contract terminated on the Tenth of July, 1936. The arrangement was found to be unsatisfactory, so the contract was not renewed. On the advice of this concern a pneumatic stamp mill was installed on the understanding that it would increase the mill capacity by 100 per cent and also, that if it was not satisfactory, the first payment would be returned and the Company would be out nothing. Several tests of the mill have been made and to date it has not approached the representations made for it. The company is willing to allow the installation to remain pending the manufacturer’s changed to prove its efficiency. If this is not done, an additional standard five-stamp unit should be installed. As heretofore reported to the stockholder’s the mill was ready the first part of July for operation. At this time the water situation became very acute in Randsburg. All properties were forced to curtail their operatioms on account of the water shortage. The result was that the Company could only obtain enough water to make some test runs. The management of your Company has been making a survey to solve the water situation, which is our only operation problem. Two plans are available. 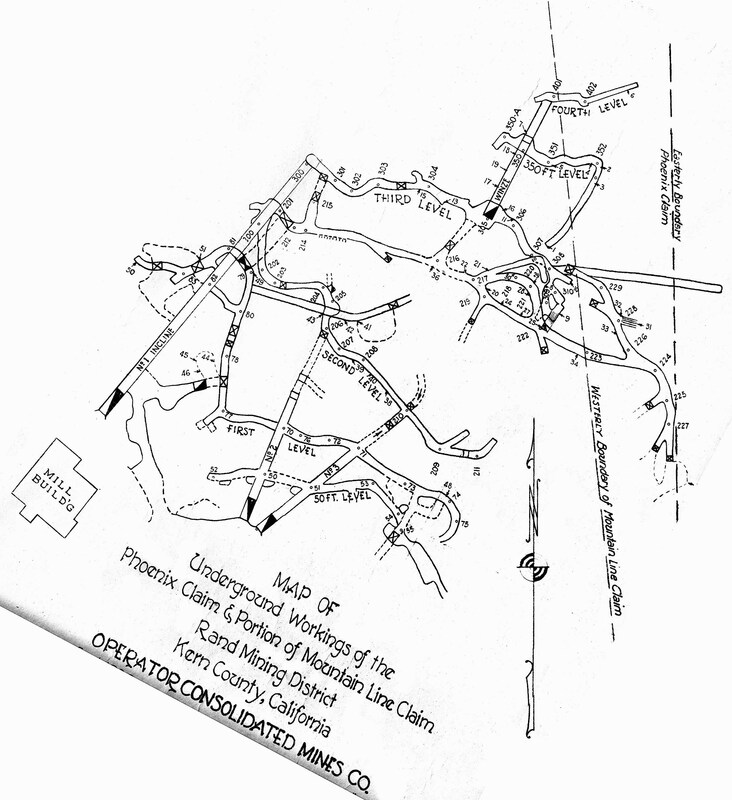 One will require a pumping plant and approximately five miles of pipe line. The other will require the sinking of a well on our own property and a pumping plant. After much consideration and consultation with well experts, it has been decided to sink a well. This project will be checked further, however, by a competent geologist. Practically all mine and mill expense are chargeable to development and mill construction and repair inasmuch as these expenses were principally incurred in putting the mine into workable condition and making repairs and test runs on the mill. However, following the Company’s conservative policy, these expenses will not be capitalized to reflect as additional assets on the balance sheet. Administrative expenses are necessarily high at the initial stage of an operation. Traveling expenses, commissions on sale of stock, legal and accounting expenses. Mr. George S. Clack, your president, has given all his time to the Company and has only been credited with a salary of $300.00 per month since January First, 1936. Previous to that time he drew no salary. It is almost entirely through his efforts that the additional acreage at Randsburg was acquired, that finances have been made available to bring the Company to the production stage and that the affairs of the company are in the excellent condition that exists today. A brief history of the official personnel of you Company may be of interest. September 13, 1938: “LEASE RANDSBURG MINES; FIVE YEARS—Randsburg, Sept. 13.—The Little Butte Mining and Milling Company, located in this district, has been leased for a period of five years by the Consolidated Mines Company of Nevada. All equipment, including the pumps and motors owned by E. L. Riggs are affected by the lease. Certain necessary repairs will be made to the pumps and motors and they will then begin pumping water to another mine held by the Consolidated Mines Company in this district, the Operator mine located near Johannesburg. The Consolidated Mines Company’s interest will be centered on development work on the Little Butte Mine after the operator mine has been provided with water. Major John Paul Jones is manager of the Consolidated Mines Company.”- Bakersfield Californian.